Recently, we made some changes to the way our webmail system works. You now have two different programs to choose from. The old program is called Horde, you can continue to use this option during the transition period. However Horde is being phased out. The new program is called Round Cube. This document will help you through using the new program. We'll start out by listing the differences and reasons for the change. The calendar application has been discontinued due to various bugs and security risks. Blacklisting and white listing is no longer available in webmail. This should be done through your spam filter's message center. Your quota usage is now displayed at the bottom of each page. Round Cube handles large emails more efficiently, reducing the amount of "stuck emails." In most cases, the new program also loads faster due to its clean interface. Switching from Horde to Round Cube should be fairly seamless. When you go to the webmail page, just click on the Round Cube icon, instead of the Horde icon. Any email you have saved on the server will still be there. Any email addresses and names saved in your address book should remain saved. The new program does look a lot different so we're going to go over each option. 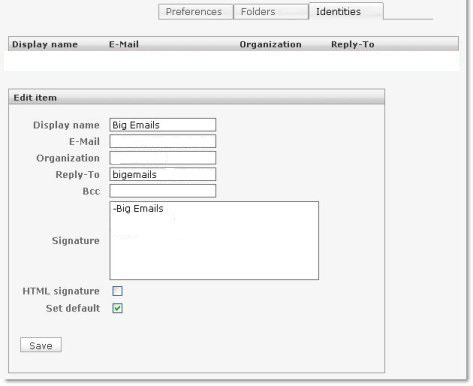 Let's use bigemails@logical.net as an example. Your username is going to be your full email address. Previously, you would just need to put in your user (bigemails) and choose your domain (logical.net) from the drop down box. That drop down box is no longer available, so you need to specify the full address. 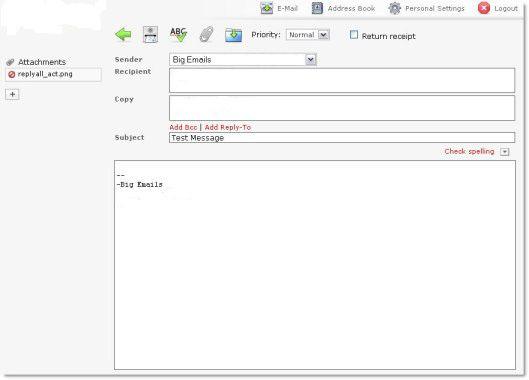 So in this example your username would be bigemails@logical.net. Your password will remain the same, and is still case sensitive. Once you have everything typed in, click login. Now that you are logged in, you can see your folders are listed on the left side, inbox, sent, trash etc. Your email is listed in the top box, and there is a box underneath that which will display the email your reading. On the bottom, there are options to select all messages, purge deleted email, and a bar showing the percentage used of your overall disk space limit. If you have more then one page of email, the icons to change pages up or down will also be displayed on the bottom of the page. At the top, there are icons to control your email, send, receive, forward, etc. And you will also see links to your address book, your settings, and a link to log out of the system. All of these features will be explained in this documentation. When you first login, your inbox is automatically displayed. To view an email, just click on the subject and the message will be displayed underneath your inbox. The selected email will be highlighted. Bold messages are new or unread. Messages you have already looked at will be in un-bolded text. To view a different folder, just click on the name of the folder you want to view. The options for each folder work the same as your inbox. Let's go through what each of the icons mean. This button will download any new messages. This happens automatically each time you log in. This is the reply button. It will automatically set up the composition page with the information necessary to reply to the sender of the selected message. This is just like the reply button, but it's used when the selected email is addressed to more the one person and you want to reply to everyone, not just the person who sent the message. This will forward the selected message, and direct you to the composition page to choose your recipient. This Icon will delete the selected message. When a message is deleted, it will be grayed out with a similar symbol on the left side of the message. To actually remove the message from your list, click on the "Purge Deleted" link at the bottom left side of the page. This icon will open the email in a new window, and automatically print it. Your computer will usually ask you which printer, and give you a chance to change the printing options. This is the button you would click on to compose, write, or send a new email. When you click on this button, you will be sent to a new page to type out your email, subject, senders etc. This is the page you are sent to any time you reply, forward, or compose a new message. To CC or BCC someone, you need to click on the "Add CC" or "Add BCC" link. You can also add attachments on this page. To do this, click the plus sign underneath the attachments heading, then click browse. Choose the file on your computer you wish to add, then click upload. To add another attachment, click the plus sign again. When you are done and wish to send the message, just click on the "Send the message now" button at the bottom of the page. You will notice this page has a new set of icons on it. We will go over those now. This button will send you back to the main page, listing your messages. This will send the message. It's the equivalent of clicking the "Send the message now" button at the bottom of the page. Clicking this icon will go through your email and check for spelling errors. There is also a "Check spelling" link at the top of the message composition box. This icon is the equivalent of checking the plus icon under the Attachments heading. This will save your email as a draft if you want to go back and finish it later. This page also has options for the priority level, if it's an important email, you can raise the priority level and the email will get marked as accordingly when it's received. You can also check the "Return receipt" box, to request an email confirmation when the recipient reads the email. The address book will show you any saved contacts. This will store names, phone numbers, email addresses, and other information so you don't have to remember it. The left hand side will display all of the saved addresses, and the right side will show the information about the selected contact. When viewing a contact, you have the option to edit it, just click on the edit contact button. This page also has function icons, which we will go over. This is the icon you click to add a new contact. The page will ask you to fill out all of the information. When you are done, click on save. This icon will delete the selected contact from your address book. You will be prompted to confirm the deletion. 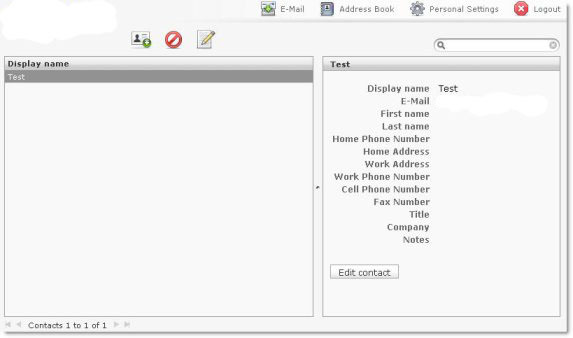 This icon will start an email, and automatically fill in the recipient with the selected address book contact. When you click on the personal settings link, you are sent to the preferences tab. You can choose your preferred language, and time zone. There is also a check box to enable or disable daylight savings time. 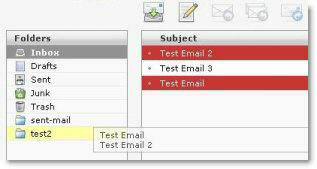 The "Rows per page" option is the number of emails which can be displayed on each page of your inbox. For example if you have 100 emails, and you want them all to be on the same page, you can change this value to 100. The "Pretty dates" option will change how the date is displayed on your email, we recommend you leave this checked. 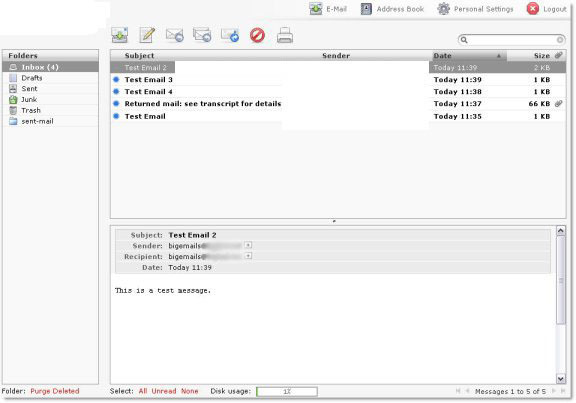 The "Display HTML" option will enable or disable viewing of HTML messages. "Show preview pane" will enable or disable the box that displays the email under the inbox when you click on it. If you disable this option, to view a message you will need to double click instead of single click and you will be sent to a new page showing only the email you chose. 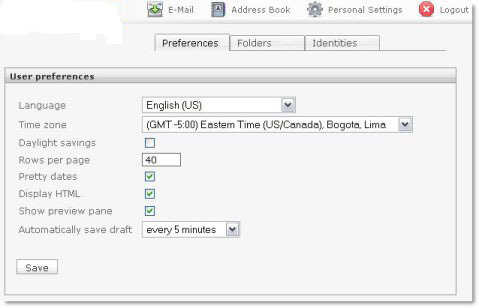 The final option "Automatically save draft" is very useful when composing a long email. The program will automatically save the email periodically so your progress is not lost. One common problem when switching to the new program is that your folders do not show up. This is very easy to solve. If you notice you previously had folders listed that no longer show up, click on the personal settings link located at the top of the page, then click on the folders tab. 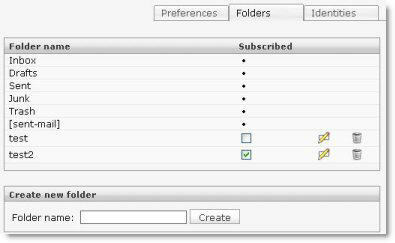 This will list your missing folders, just check the subscribed box next to each folder you want displayed on the main page. To the right of that check box, there are also icons to delete or rename each folder. You will not be able to rename or delete the default folders. There is also a box at the bottom of the page to create new folders. When you go to the Identities tab under personal settings, it will display your email address. To change your personal options, click on that email address. You will be given options for a Display Name, which is usually just your personal name, or company name. Your email address should remain as your current email address. You can also specify an Organization, a reply to address, or blind copy address, and your signature. A signature is a piece of text automatically added to every email you send out, usually your name. The HTML signature check box needs to be checked if you are including HTML in your signature. In most cases you will only have one identity so you can leave the set default box checked. Please note these are optional settings and are not required for your account to function properly. The bottom of the page has the link to purge out deleted emails underneath the folders column. To the right of this, there is a select option. You can choose to select "All" which will highlight all the messages (usually for deletion). The "None" option will reverse your "All" selection. The "Unread" option will select all unread messages. To the right of this is a disk usage graph. It will display as a bar graph, and as a percentage, the amount of space you are using. Every email account has a limit to how much email can be saved. If this reads as over 90% you might want to consider deleting some old emails, or anything with an attachment. If you go over your quota, you will not be able to receive any new messages. All the way to the right of the page, is the number of messages you are viewing. To either side of that, are arrow icons. These are used when you have multiple pages of email saved. The arrow facing left will go a page backwards. The arrow facing right will go a page forward. The arrow's with a line will go to the first or last page respectively. In some circumstances, you may want to select individual messages. To select multiple messages at a time individually, highlight the first message, then hold the Ctrl key down and choose another message. This replaces the need for a check box next to each message. Another interesting feature of the new program is its ability to drag and drop messages. For example, if you have a specific folder to put emails in, you can select an email in your inbox, and hold your left mouse button down while you drag it into the designated folder. You will notice that the folder you have selected to drop the message in will be highlighted, so you can be sure it's going where you want it to. Hovering over each icon with your mouse pointer (for example the reply button) before you click on it will display a message called a tool tip. This tool tip explains the function of the button. This way you can be sure what you are clicking on without memorizing the key from this documentation. There is also a blue bullet to the left of each message subject. Clicking this bullet will toggle the message as read or unread. Lastly, when viewing a folder, there will be headings for the Subject, Sender, Date, and Size. By clicking these columns, you can re-organize your folder to display emails alphabetically, or numerically. For example, if you are nearing your storage quota and wish to remove large messages, you can click on "Size." This will list the larger messages first so they are easier to pick out for deletion. Then, to reset your folder back to its original order, click on "Date." Clicking the title multiple times will reverse the direction, for example if you already have your messages organized to list the soonest first, and you click "Date" again, your messages will now list the oldest messages first. Clicking "Date" a second time, will revert you back to latest messages at the top.